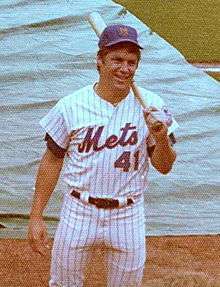 Tom Seaver made eleven Opening Day starts for the Mets. The New York Mets are a Major League Baseball (MLB) franchise based in Flushing, Queens, in New York City. They play in the National League East division. The first game of the new baseball season for a team is played on Opening Day, and being named the Opening Day starter is an honor, which is often given to the player who is expected to lead the pitching staff that season, though there are various strategic reasons why a team's best pitcher might not start on Opening Day. The New York Mets have used 24 different Opening Day starting pitchers in their 55 seasons. The 25 starters have a combined Opening Day record of 28 wins, 13 losses (27–13) and 14 no decisions. No decisions are only awarded to the starting pitcher if the game is won or lost after the starting pitcher has left the game. Tom Seaver holds the Mets' record for most Opening Day starts with 11, and has an Opening Day record of 6–0. He also has the most starts in Shea Stadium, the Mets' home ballpark from 1964 through 2008. Seaver and Dwight Gooden hold the Mets' record for most Opening Day wins with six each. Al Jackson and Roger Craig share the worst winning percentage as the Opening Day starting pitcher with a record of 0–2. From 1968 through 1983, Mets' Opening Day starting pitchers went 16 consecutive years without a loss. During this period, Tom Seaver won six starts with five no decisions, Craig Swan won two starts, and Jerry Koosman, Pat Zachry and Randy Jones won one start apiece. Furthermore, in the 31-year period from 1968 through 1998, Mets' Opening Day starting pitchers only lost two games. During that period, they won 19 games with 10 no decisions. The only losses during this period were by Mike Torrez in 1984 and by Dwight Gooden in 1990. Overall, Mets Opening Day starting pitchers have a record of 0–1 at the Polo Grounds, a 13–5 record with four no decisions at Shea Stadium and a 2–0 record with two no decisions at Citi Field. In addition, although the Mets were nominally the home team in 2000, the game was played in Tokyo Dome in Tokyo, Japan. Mike Hampton started the game in Tokyo and lost, making the Mets' Opening Day starting pitchers' combined home record 14–7, and their away record 12–5. The Mets went on to play in the World Series in 1969, 1973, 1986, 2000 and 2015, and won the 1969 and 1986 World Series championship games. Tom Seaver (1969 and 1973), Dwight Gooden (1986), Mike Hampton (2000) and Bartolo Colón (2015) were the Opening Day starting pitchers when the Mets played in the World Series, and they had a combined Opening Day record of 3–1 with one no decision. Season Each year is linked to an article about that particular Mets season. 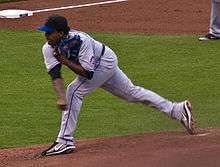 "New York Mets Opening Day Starters and Results". Baseball-Reference.com. Retrieved September 8, 2008. 1 2 "Box Score Mets vs. Cubs March 29, 2000". Baseball-Reference.com. Retrieved September 20, 2008. ↑ "Opening Day 1962". Baseball-Reference.com. Retrieved November 26, 2008. 1 2 3 4 5 6 7 8 9 10 11 12 13 14 15 16 17 18 19 20 21 22 23 24 25 "New York Mets Opening Day History". www.baseball-almanac.com. Retrieved September 7, 2008. ↑ "Opening Day 1963". Baseball-Reference.com. Retrieved November 26, 2008. ↑ "Opening Day 1964". Baseball-Reference.com. Retrieved November 26, 2008. ↑ "Opening Day 1965". Baseball-Reference.com. Retrieved November 26, 2008. 1 2 3 4 5 6 7 8 9 10 11 12 13 Noble, Marty (April 3, 2008). "Shea sees its share of Amazin' openers". mlb.com. Retrieved September 20, 2008. ↑ "Opening Day 1966". Baseball-Reference.com. Retrieved November 26, 2008. ↑ "Opening Day 1967". Baseball-Reference.com. Retrieved November 26, 2008. ↑ "Opening Day 1968". Baseball-Reference.com. Retrieved November 26, 2008. ↑ "Opening Day 1969". Baseball-Reference.com. Retrieved November 26, 2008. ↑ "Opening Day 1970". Baseball-Reference.com. Retrieved November 26, 2008. ↑ "Opening Day 1971". Baseball-Reference.com. Retrieved November 26, 2008. ↑ "Opening Day 1972". Baseball-Reference.com. Retrieved November 26, 2008. ↑ "Opening Day 1973". Baseball-Reference.com. Retrieved November 26, 2008. ↑ "Opening Day 1974". Baseball-Reference.com. Retrieved November 26, 2008. ↑ "Opening Day 1975". Baseball-Reference.com. Retrieved November 26, 2008. ↑ "Opening Day 1976". Baseball-Reference.com. Retrieved November 26, 2008. ↑ "Opening Day 1977". Baseball-Reference.com. Retrieved November 26, 2008. ↑ "Opening Day 1978". Baseball-Reference.com. Retrieved November 26, 2008. ↑ "Opening Day 1979". Baseball-Reference.com. Retrieved November 26, 2008. ↑ "Opening Day 1980". Baseball-Reference.com. Retrieved November 26, 2008. ↑ "Opening Day 1981". Baseball-Reference.com. Retrieved November 26, 2008. ↑ "Opening Day 1982". Baseball-Reference.com. Retrieved November 26, 2008. ↑ "Opening Day 1983". Baseball-Reference.com. Retrieved November 26, 2008. ↑ "Opening Day 1984". Baseball-Reference.com. Retrieved November 26, 2008. ↑ "Opening Day 1985". Baseball-Reference.com. Retrieved November 26, 2008. ↑ "Opening Day 1986". Baseball-Reference.com. Retrieved November 26, 2008. ↑ Durso, Joseph (April 6, 1987). "Unflappable Ojeda accepts new role for season opener". The New York Times. Retrieved September 20, 2008. ↑ "Opening Day 1987". Baseball-Reference.com. Retrieved November 26, 2008. ↑ Berkow, Ira (April 5, 1988). "Nouvelle Doc on Opening Day". The New York Times. Retrieved September 20, 2008. ↑ "Opening Day 1988". Baseball-Reference.com. Retrieved November 26, 2008. ↑ Durso, Joseph (April 4, 1989). "Bands March, Flags Fly and the Mets Beat the Cards". The New York Times. Retrieved September 20, 2008. ↑ "Opening Day 1989". Baseball-Reference.com. Retrieved November 26, 2008. ↑ Smith, Claire (April 10, 1990). "Rocky Start for Gooden With Signs for Hope". The New York Times. Retrieved September 20, 2008. ↑ "Opening Day 1990". Baseball-Reference.com. Retrieved November 26, 2008. ↑ Sexton, Joe (April 9, 1991). "Gooden Leaves His Stamp on the Phillies". The New York Times. Retrieved September 20, 2008. ↑ "Opening Day 1991". Baseball-Reference.com. Retrieved November 26, 2008. ↑ Sexton, Joe (April 6, 1992). "Mets Defense: Armed and Precarious". The New York Times. Retrieved September 20, 2008. ↑ "Opening Day 1992". Baseball-Reference.com. Retrieved November 26, 2008. ↑ Sexton, Joe (April 6, 1993). "For Openers, Gooden and Key Close Down the Batters". The New York Times. Retrieved September 20, 2008. ↑ "Opening Day 1993". Baseball-Reference.com. Retrieved November 26, 2008. ↑ Frey, Jennifer (April 5, 1994). "It's a Grand Day for the Yankees and a Windy One for the Mets". The New York Times. Retrieved September 20, 2008. ↑ "Opening Day 1994". Baseball-Reference.com. Retrieved November 26, 2008. ↑ Frey, Jennifer (April 27, 1995). "This One Has It All, Except Met Victory". The New York Times. Retrieved September 20, 2008. ↑ "Opening Day 1995". Baseball-Reference.com. Retrieved November 26, 2008. ↑ Willis, George (April 2, 1996). "Determined Mets Climb Out of a 6-0 Hole to Top Cards". The New York Times. Retrieved September 20, 2008. ↑ "Opening Day 1996". Baseball-Reference.com. Retrieved November 26, 2008. ↑ Olney, Buster (April 2, 1997). "For Openers, Padres' Big-Bang Theory Subdues the Mets". The New York Times. Retrieved September 20, 2008. ↑ "Opening Day 1997". Baseball-Reference.com. Retrieved November 26, 2008. ↑ Diamos, Jason (April 1, 1998). "It's A Midsummer Classic in March as Mets Nip Phillies". The New York Times. Retrieved September 20, 2008. ↑ "Opening Day 1998". Baseball-Reference.com. Retrieved November 26, 2008. ↑ Diamos, Jason (April 6, 1999). "It's New Day, But the Mets Are Stranded AT the Gate". The New York Times. Retrieved September 20, 2008. ↑ "Opening Day 1999". Baseball-Reference.com. Retrieved November 26, 2008. ↑ Vescey, George (March 30, 2000). "Mets' Start Is Finally Here, Although It's Over There". The New York Times. Retrieved September 20, 2008. ↑ Kepner, Tyler (April 4, 2001). "Playoffs Start Early for Mets and the Braves". The New York Times. Retrieved September 20, 2008. ↑ "Opening Day 2001". Baseball-Reference.com. Retrieved November 26, 2008. ↑ Hermoso, Rafael (April 2, 2002). "Leiter Looks Like the Ace The Mets Need This Season". The New York Times. Retrieved September 20, 2008. ↑ "Opening Day 2002". Baseball-Reference.com. Retrieved November 26, 2008. ↑ Hermoso, Rafael (April 1, 2003). "Mets' Chance at Fresh Start Quickly Turns Into 'Disaster'". The New York Times. Retrieved September 20, 2008. ↑ "Opening Day 2003". Baseball-Reference.com. Retrieved November 26, 2008. ↑ Jenkins, Lee (April 7, 2004). "Smashing Start For Mets Begins On the First Pitch". The New York Times. Retrieved September 20, 2008. ↑ "Opening Day 2004". Baseball-Reference.com. Retrieved November 26, 2008. ↑ Noble, Marty (April 4, 2005). "Despite loss, new Mets impress". mlb.com. Retrieved September 20, 2008. ↑ "Opening Day 2005". Baseball-Reference.com. Retrieved November 26, 2008. ↑ Noble, Marty (April 3, 2006). "Nady, Glavine star for Mets in opener". mlb.com. Retrieved September 20, 2008. ↑ "Opening Day 2006". Baseball-Reference.com. Retrieved November 26, 2008. ↑ Borzi, Pat (April 2, 2007). "For Starters, Sturdy Effort and Victory for Glavine". The New York Times. Retrieved September 20, 2008. ↑ "Opening Day 2007". Baseball-Reference.com. Retrieved November 26, 2008. ↑ Shpigel, Ben (April 1, 2008). "Santana's Start Helps Mets Forget Finish". The New York Times. Retrieved September 20, 2008. ↑ "Opening Day 2008". Baseball-Reference.com. Retrieved November 26, 2008. ↑ "NY Mets 2, Cincinnati 1". Yahoo!. Retrieved April 6, 2009. 1 2 "NY Mets 7, Florida 1". Yahoo!. Retrieved April 6, 2009. ↑ "NY Mets 1, Atlanta 0". Yahoo!. Retrieved May 28, 2012. ↑ "NY Mets 11, San Diego 2". Yahoo!. Retrieved April 7, 2013. ↑ "Washington 9, NY Mets 7". Yahoo!. Retrieved April 1, 2014. ↑ "MY Mets 3, Washington 1". Yahoo!. Retrieved April 6, 2015. ↑ "Royals hold off Mets 4-3 in opening rematch of World Series". Yahoo!. April 3, 2016. Retrieved April 4, 2016.